KABUL - Latest figures released today by the UN Assistance Mission in Afghanistan (UNAMA) show continuing record high casualty rates being inflicted on the Afghan civilian population by the warring parties. Covering the period 1 January to 30 June 2018, findings include the killing of more civilians in the first six months of this year – 1,692 deaths – than at any comparable time over the last ten years since records have been kept. UNAMA renews its call on parties to the conflict to increase efforts to protect the civilian population and encourages parties to work towards reaching a peaceful settlement. UNAMA’s latest update documents 5,122 civilian casualties (1,692 deaths and 3,430 injured) - a three per cent overall decrease from last year – with civilian deaths up by one per cent, the most recorded in the same time period, since UNAMA began systematic documentation of civilian casualties in 2009. The number of civilians injured decreased by five per cent. 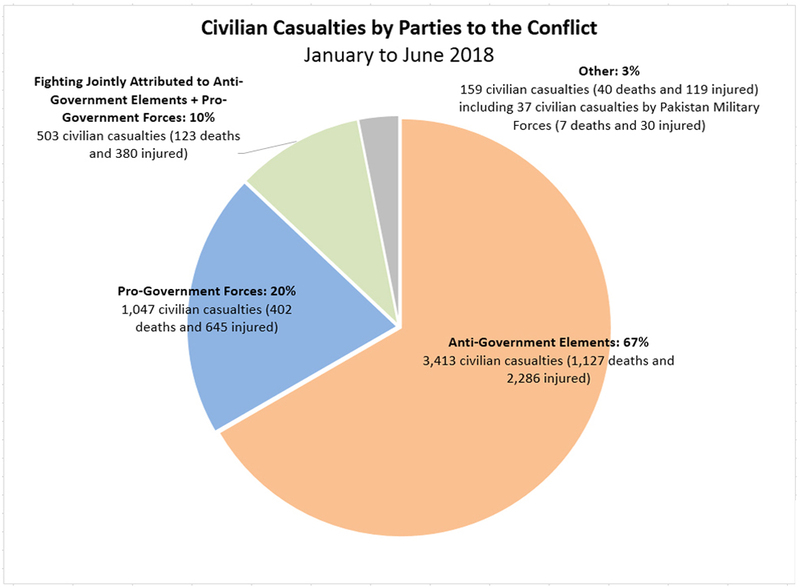 Civilian casualty figures remain at record highs despite the unprecedented unilateral ceasefires by Government and Taliban that occurred over the three-day period 15-17 June 2018. Aside from casualties resulting from two Daesh/Islamic State-Khorasan Province (ISKP)-claimed suicide attacks in Nangarhar during the ceasefires, UNAMA documented almost no other civilian casualties during the break in fighting. “The brief ceasefire demonstrated that the fighting can be stopped and that Afghan civilians no longer need to bear the brunt of the war,” said Tadamichi Yamamoto, the UN Secretary-General’s Special Representative for Afghanistan. “We urge parties to seize all opportunities to find a peaceful settlement – this is the best way that they can protect all civilians,” said Yamamoto, who is also head of UNAMA. The use of improvised explosive devices (IEDs) in attacks by Anti-Government Elements remained the leading cause of civilian casualties. The combined use of suicide and non-suicide IEDs caused nearly half of all civilian casualties. 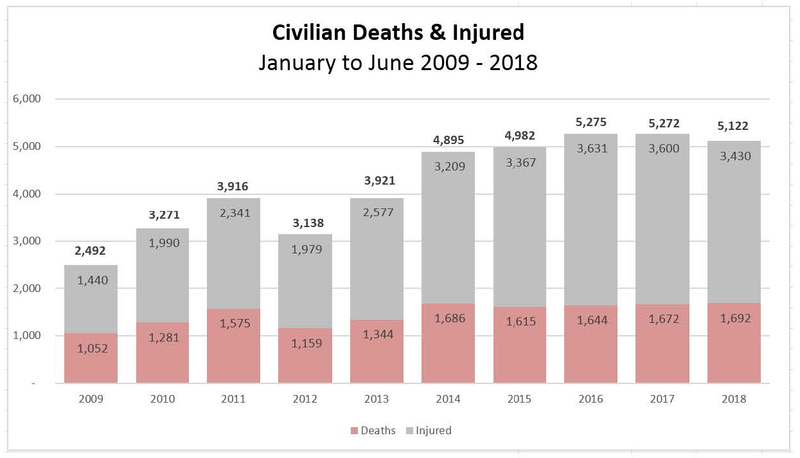 Continuing trends first documented last year by UNAMA, the majority of IED casualties were caused by suicide and complex attacks, which again were responsible for record high civilian casualties, resulting in 1,413 civilian casualties (427 deaths and 986 injured), a 22 per cent increase. UNAMA attributed 52 per cent of civilian casualties from suicide and complex attacks to Daesh/ISKP, mainly in Kabul and Nangarhar province. The Taliban were responsible for 40 per cent, the remainder were attributed to unidentified Anti-Government Elements. While the mission documented decreases in civilian casualties from some incident types, notably an 18 per cent reduction in casualties caused by ground engagements, UNAMA documented a disturbing increase in the number of civilian casualties from suicide and complex attacks by Anti-Government Elements, with more than half attributed to Daesh/ISKP. The mission also documented a sharp increase in civilian casualties from aerial attacks by Pro-Government Forces. The armed conflict caused 544 women casualties (157 deaths and 387 injured), with almost half from ground engagements. While overall women casualties decreased by 15 per cent compared to the same period in 2017, women casualties remain a matter of grave concern. UNAMA recorded 1,355 child casualties (363 deaths and 992 injured), a 15 per cent drop compared to the same period in 2017. Though UNAMA recorded decreases in child casualties from explosive remnants of war, 89 per cent of civilian casualties from explosive remnants of war were children. “UNAMA continued to document the toxic consequences of this conflict, with Afghan boys and girls killed, maimed, sexually assaulted, abused, recruited and used by parties to the conflict,” said Danielle Bell, UNAMA’s Human Rights Chief. “Conflict related violence continued to erode the rights of children to education, healthcare, freedom of movement and other fundamental rights, as well as family life, playing outdoors and simply enjoying a childhood free of the brutal effects of war,” said Bell. The mission is concerned by the emerging trend of targeting of education facilities by Anti-Government Elements as a reaction to operations by Pro-Government Forces. In Nangarhar province alone, through the month of June, the mission recorded 13 related incidents attributed to Daesh/ISKP. UNAMA recorded 341 civilian casualties (117 deaths and 224 injured) from election-related violence. Such violence began with the start of voter registration on 14 April, after which UNAMA documented attacks on tazkira (national ID) distribution centres and voter registration sites, as well as election-related personnel, through the use of IEDs, suicide attacks and targeted killings. UNAMA is concerned that the number of civilian casualties attributed to Anti-Government Elements continued at record high levels, including increased civilian casualties from attacks targeting civilians. Anti-Government Elements caused 3,413 civilian casualties (1,127 deaths and 2,286 injured). UNAMA attributed 67 per cent of all civilian casualties to Anti-Government Elements, with 42 per cent attributed to the Taliban, 18 per cent to Daesh/ISKP, and seven per cent to unidentified others. The continued use of indiscriminate and unlawful pressure-plate IEDs by Anti-Government Elements caused 314 civilian casualties (114 deaths and 200 injured), mostly attributed to the Taliban. This represents a 43 per cent reduction compared to the same period last year. The mission also recorded a 23 per cent decrease in civilian casualties caused by Anti-Government Elements (mainly Taliban) during ground engagements. UNAMA has engaged in extensive advocacy efforts with parties to the conflict on civilian casualties caused by pressure-plate IEDs and ground engagements over the past several years. UNAMA attributed 1,047 civilian casualties to Pro-Government Forces, approximately the same as during the corresponding period in 2017. Pro-Government Forces caused 20 per cent of all civilian casualties in the first half of 2018 (17 per cent by Afghan national security forces, two per cent by international military forces, and one per cent by pro-Government armed groups). The mission documented a 21 per cent reduction in ground engagement civilian casualties attributed to Pro-Government Forces (mainly Afghan national security forces), though this was offset by a significant increase in civilian casualties from aerial attacks. 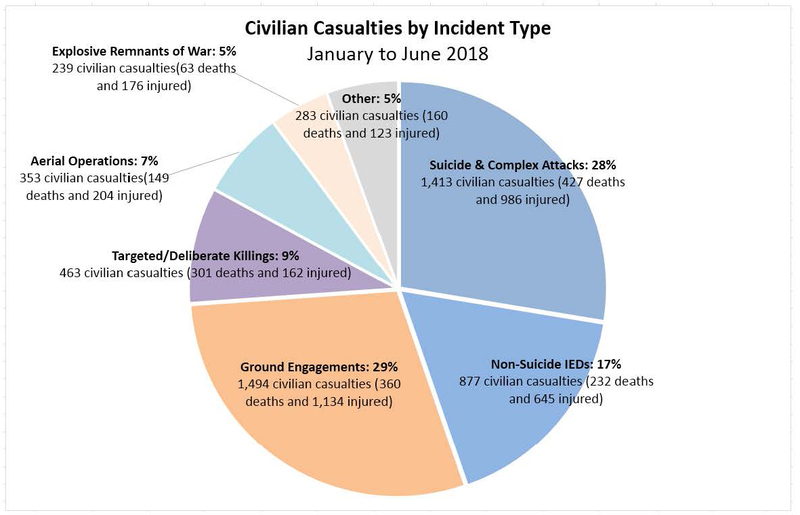 Amidst continued reports of expanded airstrike operations, during the first six months of 2018, the mission documented 353 civilian casualties (149 deaths and 204 injured) from aerial attacks, a 52 per cent increase from the same period in 2017. The mission attributed 52 per cent of all civilian casualties from aerial attacks to the Afghan Air Force, 45 per cent to international military forces, and the remaining three per cent to unidentified Pro-Government Forces. The report urges forces to uphold their commitments to take continuous steps to improve civilian protection in their aerial operations.